Breakthrough in search for peanut allergy cure as study finds simple approach incredibly effective. At risk infants who were fed peanuts had an 81% reduced risk of developing a peanut allergy, a new study finds. The study could mean a complete reversal of the established advice to avoid feeding peanuts to at-risk children. 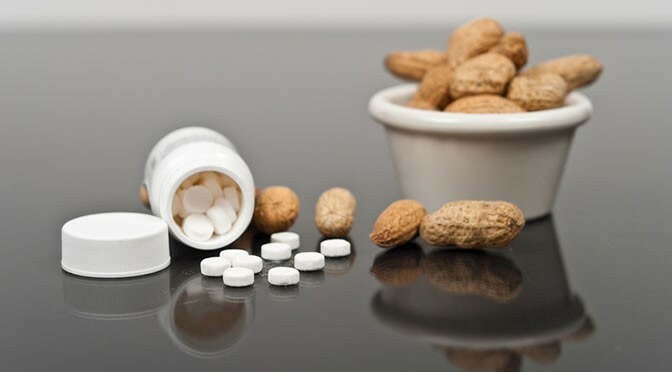 The clinical trial into a peanut allergy cure was inspired by the fact that Israeli children have much lower rates of peanut allergies than Jewish children in the UK. Researchers wondered if this could be because Israeli children typically begin eating foods containing peanuts earlier in life. The study, which is published in the New England Journal of Medicine, recruited 600 at-risk infants under one-year-old (Du Toit et al., 2015). Half avoided peanuts, while the other half were given at least 6 grams of peanut protein each week. The potential peanut allergy cure continued for five years, while the researchers followed their progress. At the end of the study the researchers found an 81% reduction in the risk of developing a peanut allergy among children exposed to peanuts. “Food allergies are a growing concern, not just in the United States but around the world. For a study to show a benefit of this magnitude in the prevention of peanut allergy is without precedent. The study — nicknamed ‘Learning Early About Peanut Allergy (LEAP) — heralds an about-face in advice on a peanut allergy cure. “Prior to 2008, clinical practice guidelines recommended avoidance of potentially allergenic foods in the diets of young children at heightened risk for development of food allergies. “The study also excluded infants showing early strong signs of having already developed peanut allergy. The safety and effectiveness of early peanut consumption in this group remains unknown and requires further study. It is not yet known if children need to keep up their peanut consumption to maintain their tolerance. Follow-up research, called LEAP-On, will test further test the potential peanut allergy cure.